Earlier in the year, I published my thoughts on the top 3-4 "sleepers" at each of the IDP positions. However, those picks were largely for those who play in shallow to mid-sized leagues. That said, I also wanted to provide some insights on my top value plays for those who play in deeper/more competitive IDP leagues. These are players you can typically add on near the add of drafts or who can even be scooped up off the waiver wire. The IDP pool is particularly deep this season (especially at LB position), so don't be afraid to take a shot on a few late-round fliers as you can always replace them if they aren't performing. 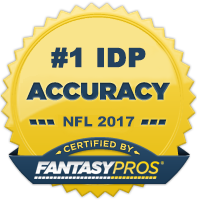 Also, make sure to Follow me on Twitter where I will be dishing out IDP fantasy advice on a regular basis throughout the regular season. I will periodically update these throughout the off-season to reflect changes in free agency, defensive schemes, playing time, draft selections, etc. However, keep in mind that the information listed here is just a small sample of a much larger set of rankings and descriptions that are accessible through purchasing my 2016 Fantasy Football Draft Guide. DE Vinny Curry (PHI) - Vinny Curry should be one of the main beneficiaries of Philadelphia's newly installed "Wide 9" defensive scheme that heavily emphasizes defensive end pass rush. Despite being drastically miscast as a 3-4 defensive end in Billy Davis' system, he still managed 16.5 sacks over three years in a part-time role. The Eagles believe he is a great fit in new defensive coordinator Jim Schwartz's defense and consequently re-signed him to a sizable, long-term contract. Now in a full time role, Curry could near or even exceed double digit sack totals in 2016. DE Devin Taylor (DET) - Taylor emerged as a serious pass-rushing threat last year compiling seven sacks on a part-time basis. With 2015 starter Jason Jones now with Miami, Taylor will move into a near every down role opposite Ezekiel Ansah. The increased snap count makes Taylor a good bet to reach double digit sacks this season and he could provide DL3 value or higher at a fraction of the cost. DE Danielle Hunter (MIN) - Hunter had a sneakily good rookie campaign in which he logged 30+ total tackles and five sacks while playing just 394 snaps. Coach Mike Zimmer tends to bring his rookies along slowly but has been notably impressed with how quickly Hunter has developed. Current starter Brian Robison is 33 years old, so Hunter is very likely to see a significant bump in playing time and has an outside chance of securing a starting role before the start of the regular season. ILB Bernardrick McKinney (HOU) - McKinney has a chance to take a big step forward in his second season. Injuries have derailed Brian Cushing's career to the point where he's not a real competition threat. The main question around McKinney is if the Texans will trust him in a three down role. Based on training camp and the preseason, it's looking like that is a good possibility. ILB Blake Martinez (GB) - Martinez, a 4th round selection in this year's draft, has been playing every down in training camp and in the preseason. It's hard to decipher if that will hold true into the regular season as both Sam Barrington and Jake Ryan have missed time due to injuries. But, my gut tells me it will. There's obviously risk with this pick but Martinez has too much upside not to add as your LB5/LB6. OLB Preston Smith (WAS) - Smith is one of my top OLB pass-rush candidates for a breakout season. He showed flashes of elite potential last year in limited snaps (8 sacks in just over 500 snaps) and will be pushed into a near every down role this year due Junior Galette's season-ending injury. He's played very well so far this preseason and should be on your radar as a deep sleeper in big play leagues. ILB Zach Orr (BAL) - Zach Orr has been lighting it up so far in the preseason and is starting to cement himself as the starting ILB next to C.J. Mosley. Given the assist-heavy nature of the Baltimore stat crew, Orr could make for a nice high floor play similar to Daryl Smith last year. One of the better late round values in very deep/competitive IDP leagues. SS Tony Jefferson (ARZ) - Jefferson had a couple big games early in the season but quickly tampered off as Deone Bucannon, Rashad Johnson, and Tyrann Mathieu began consuming a lion's share of the production. With Johnson gone, Jefferson will compete with Tyvon Branch and DJ Swearinger for the starting strong safety position and could see starter playing time early in the season as the Honey Badger returns from injury. The coaching staff considers him one of the leaders of the defense, so I'm banking on him assuming a near-full time role. FS Darian Thompson (NYG) - The Giants have been struggling to fill their free safety position for the last couple seasons and may have finally found their man in rookie Darian Thompson. He doesn't leap off the page as a player with superstar potential, but if he can just play well enough to hold on to the starting gig, he has a chance to be one of this year's bigger surprises in the IDP world. He's not a player I'm willing to fall on my sword for, but is someone I would definitely take a chance on as my DB4/DB5. SS Rafael Bush (DET) - Bush looks to have garnered the starting strong safety role in Detroit. Depending on how well DeAndre Levy bounces back from injury, that position could have fairly strong value this year. Bush showed flashes of fantasy viability in New Orleans, so he's a decent player to target late in drafts.